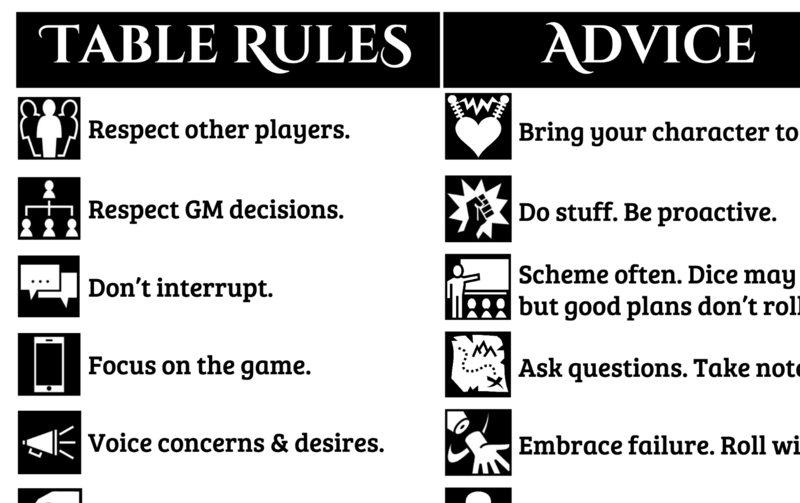 I updated my “Table Rules” handout with some additional player advice and some cleaner formatting. I hope you find it useful! While most of the rules make sense, I think it’s worth expanding on a few of them. I’ve found games to be much more interesting and enjoyable if the players actually do the things the say. It reflects how their character might actually respond. It has a side-benefit of encouraging players to be specific and careful with what they say. Win Win. Bring your character to life. Stolen from Grant Howitt’s second point, I’ve seen this at the table a lot. Players either see their character as a vehicle to kill monsters and solve puzzles (like a video game avatar) OR their character is the hero of a story no one else knows. Both are bad and hard to for other players to work with. It’s up to the player to bring their character to life. Good plans don’t roll. This is an OSR concept stolen from Type1Ninja. I try to make this true as often as I can: players who prepare and invest energy in a plan shouldn’t have that plan ruined with a bad roll. In fact they shouldn’t have to roll at all if the plan is good enough. Try this in your own games, and your players will suddenly become WAY more creative to avoid having to deal with crappy rolls. Fight dirty. This is a reminder to myself as much as the players. It’s easy for me to hold back in combat, let players make dumb mistakes, or go easy on them when they just mindless attack everything. But that makes the game boring. They should be afraid, desperate, careful. And retreat should always be on the table. Answer is not on your character sheet. I’ve seen this floating around a number of places, and I really like it. It sums up a lot of other rules, and encourages players to think for themselves rather than just hoping to have the right ability or item. If there’s something else you’d like to see added to it, let me know in the comments below.